Ensuring the longevity of your dentures. Keeping your dentures in tiptop shape will ensure their longevity as well as a better fit. Dentures are an investment and require adequate care and attention. Dentures, like natural teeth should be cleaned daily. You should rinse your dentures with warm water after each meal. When it comes to cleaning your dentures, you should brush them as you would your normal teeth, but the trick is doing so without the use of toothpaste. Many commercial brands of toothpaste are not suitable for dentures and can, in fact, damage them. Instead, you should use a soft bristled brush specifically designed for dentures and clean the surface making sure not to bend any attachments. You can buy effervescent tablets used specifically for soaking dentures, however, it should be noted that soaking your dentures is not a substitute for brushing them! Brushing your dentures will ensure effective removal of plaque. Fold a towel near the sink when handling your dentures, this way; if you drop them, there is less chance of breakage. Similarly, the sink should be filled with water to avoid breakage in the event of dropping your dentures. Give your dentures a thorough rinse in warm water to remove any loose food particles. Moisten your denture brush and gently clean the surface. Rinse with clean, warm water. Dentures need to be kept moist when not worn to avoid drying out and losing their shape. 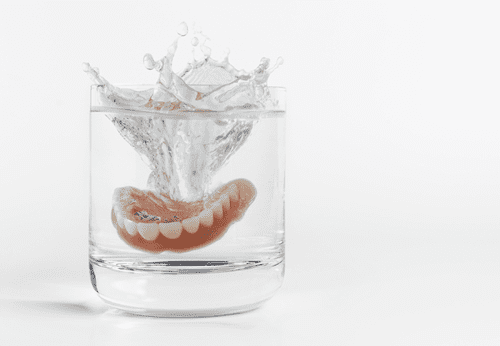 When not being worn, your dentures should be placed in a soaking solution or in water. You should ensure that the water is not hot as this could result in warping – cold water is best. Take care, if your dentures have metal attachments, cleaning solutions may cause these to tarnish, speak to your dentist about the most effective cleaning methods if this is the case. In short, yes. The materials used to make dentures are more fragile than natural teeth and can crack or chip if dropped or due to ill maintenance. Your dentist can determine whether or not your dentures are due to be replaced. On average, dentures need to be replaced every 3 – 8 years. Can I use my toothbrush to clean my dentures? No. Even a traditional soft bristled toothbrush can damage the surface of your dentures. It is best to use a soft brush that is made specifically for denture cleaning to ensure that you preserve the surface of your dentures. Can I use normal toothpaste when brushing my dentures? No. Regular toothpaste can be too abrasive on the surface of dentures. Regular toothpaste may scratch your dentures, making them more difficult to clean in the future. Instead, you should use special toothpaste or cream designed for cleaning dentures. What should I do with my dentures when I am not wearing them? Dentures need to be kept in a safe place when not in use, such as a place where they will not fall or be in reach of children or pets. They should be stored in cool water to keep them moist so that they do not dry out and crack. To find out more about caring for your dentures, book a consultation at Dentures at Clayfield.